​Build with straws: set out straws, scissors, tape, glue, yarn, and ask the children to connect the straws to build something. They will discover what works and what doesn’t work. Older children can be directed to try to build a square; a box; a house; a pathway etc. Try to make a boat that floats on water with some straws and tape. Try it out. Older children can be shown how to use paper clips to join straws, to make more stable structures. (See web site below). ​Because of the intrinsic strength and structure of drinking straws, they can be used in a basic exploration of the principles of structural engineering. I have 3 straws to make a shape. What shape could I make? How about 4? Could I make a circle with straws? How? 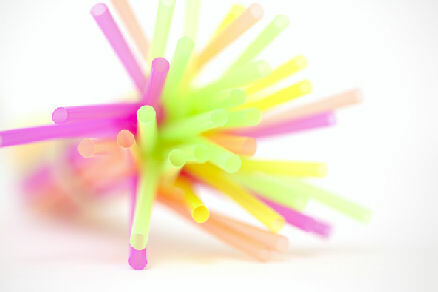 ​​Straws can be used for other interesting explorations. Investigate what can be done with a straw and a glass/bowl of water. Press one end of a straw flat. Cut each side of the flattened end to form a V. It doesn’t take too many tries to make a loud oboe-like sound. Feel the straw vibrating. Cut the end shorter to change the pitch.